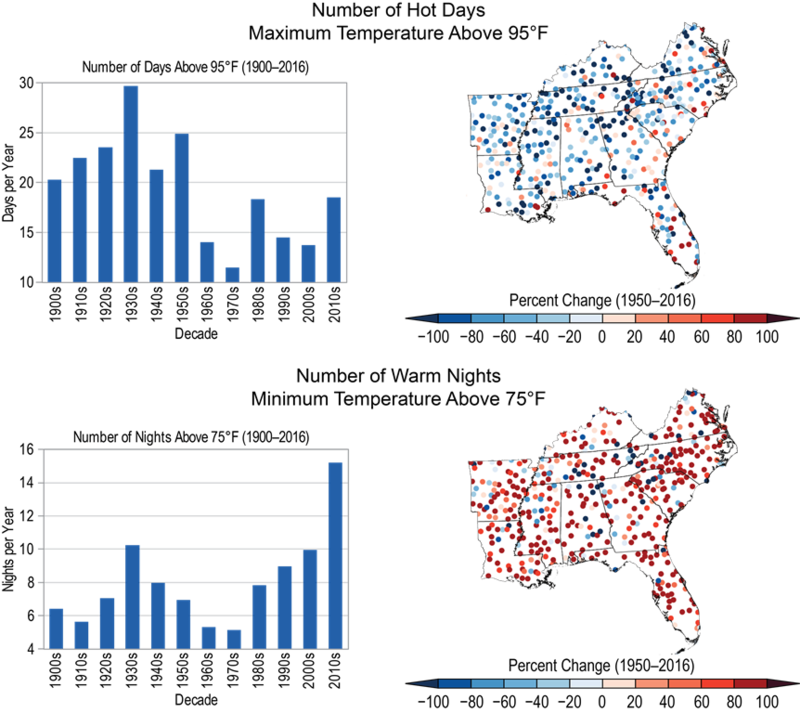 This latest Federal Climate Report follows the same pattern as previous ones. Cherry pick a few bad weather events, ignore all of the bad weather which did not happen, and extrapolate the lot using the most scary scenarios. 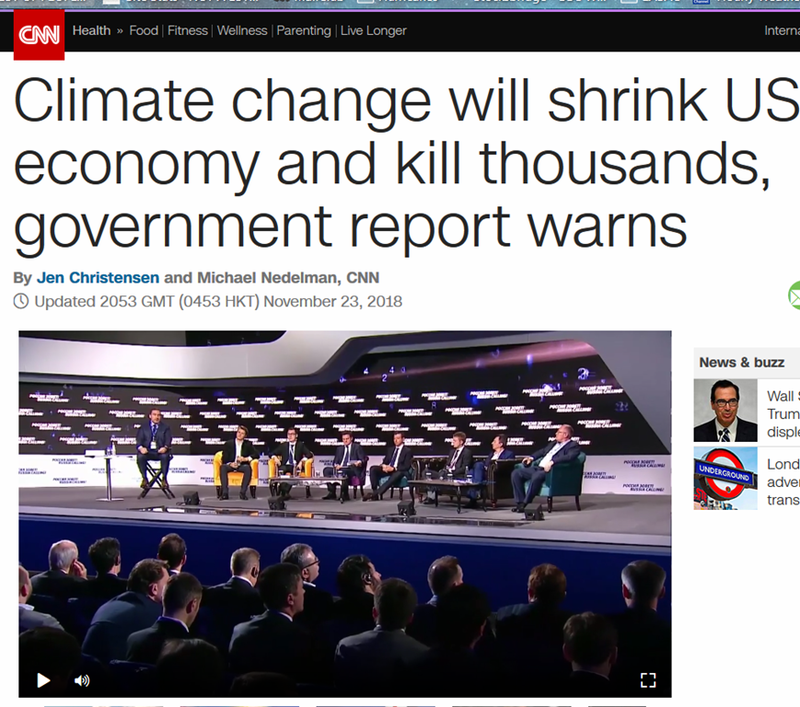 Last year, they issued the “Climate Science Special Report”, which basically summed up past climate trends and projected forwards. That was Vol I of the Fourth National Climate Assessment, which I dissected here. The latest publication is Vol II, which looks at impacts, risks and adaptation, down to regional level. Vol II is here. Inevitably it is a huge report, reflecting how many climate scientists have contributed to it. Never mind the quality, feel the width! This is the exact wording in the National Climate Assessment (NCA), in Section 4 – Rural Impacts in the Southeast. Inevitable “heatwaves” are something which crop up frequently in the NCA, inevitably getting worse! 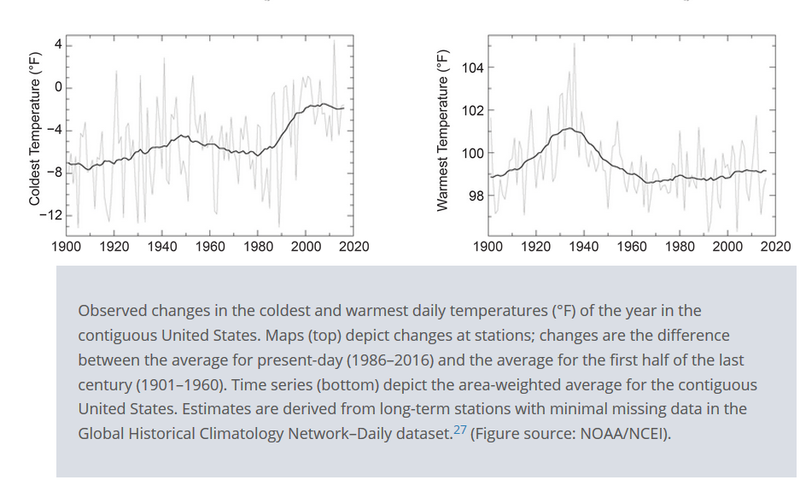 All three indicators, highest temperatures, number of warm days and heat wave intensity very clearly show that heatwaves across the US as a whole were far worse prior to 1960. The climate establishment likes to pretend that this was just a quirky phenomenon limited to the dustbowl years. The charts give the lie to this. Periods such as the 1920s and 50s also exhibited heatwaves more intense than anything experienced recently. Back to the Southeast, however. 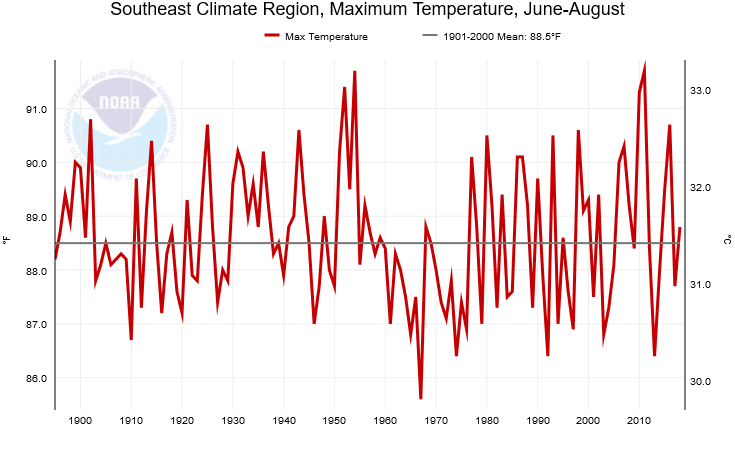 According to NOAA, average summer daytime temperatures were every bit as high in the years prior to 1960. It is little wonder that climate scientists love to begin their trends from the 1960s or 70s! Even the most recent decade is no worse than the 1980s. While the past is no guide to the future, there is no evidence that to support the NCA’s claims of extreme heat. It is true that night time temperatures appear to be on a rising trend. But how much of this is due to UHI? In any event, while accepting that hot nights can be a real problem for health, we now have something called “Air Conditioning”. Instead of wasting billions on tackling climate change, would it not be better to ensure that everybody in need gets proper air conditioning for their homes. Along, of course, with affordable electricity to run it. CNN is equivalent to the BBC in its use of propaganda, but at least the public are not forced to pay to watch or subscribe to it. Crapita came visiting on Friday but annoyingly didn’t log the time. Always nice to know by how much I wasn’t there to say ‘hello’. Its not ‘hot’ nights, its slightly warmer. It is exactly what to expect from more humans living in larger cities, intensive agriculture, and 24/7 lifestyles. The ‘average’ temp is slightly increasing because the minimum is increasing slightly more than the maximum is decreasing. Its an outbreak of life threatening mildness. The whole thing is a complete load of BS. Spot on Paul. And as JimW says, ‘the whole thing is a complete load of BS’! Difficult to argue with that. About 1955 (+/-) in western Pennsylvania we had a hot streak. We did not have AC, and doing anything, even sleeping, was difficult. I think “The South” will survive. However, I don’t like the weather under normal conditions. The National Climate Assessment is a major waste of time and money. May I suggest a correction, Paul. If so – pls feel free to delete this message. Doesn’t anyone fact check these outlandish claims? Anyone? Yes, Paul does for one. And there are others who post of WUWT and now CFACT as well. But the media has no interest in publicising this – and certainly not the BBC/Guardian. As the world cools the climate warming horror hyperbole kicks ever harder. I believe the region referred to is >50km up and is already -100C. We should begin to get interested if the troposphere, i.e., where people live, starts showing the same thing. IMO what happens in the atmosphere — all the atmosphere — will affect us on the lower levels. When the thermosphere shrinks what happens at the lower levels? If the distance between between the bottom and the top of the atmosphere (top of thermosphere to the bottom of the troposphere), will this not impact on how the weather and climate evolves now? This atmosphere is connected from bottom to top, Jit. It is in a dynamic connected relationship. Just exactly what the final result will be is not realizable at this time — we have not witnessed this before. Sure you could run a computer model but on what? No prior data, no understanding of the process. You imply that changes in the upper atmosphere could not affect the lower levels, IMO that is probably very wrong, and a symptom of disconnected thinking — unless you have verified evidence that your assertion is true. I’m prepared to believe that such connections exist. The question is, how much can the little bit of atmosphere up there affect the big bit down here, i.e. can the tail wag the dog? I guess we’ll find out in due course.